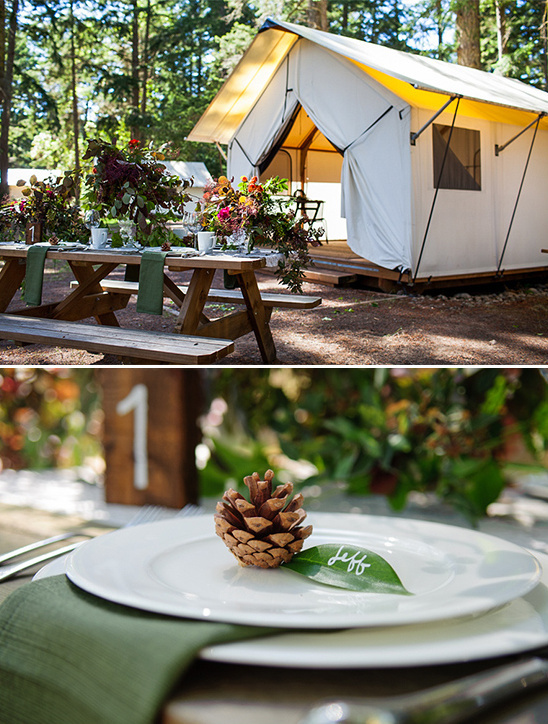 Glamping, also known as glamorous camping, is a craze that has been sweeping through society. It's all about being able to enjoy nature without losing some of the luxuries of home. 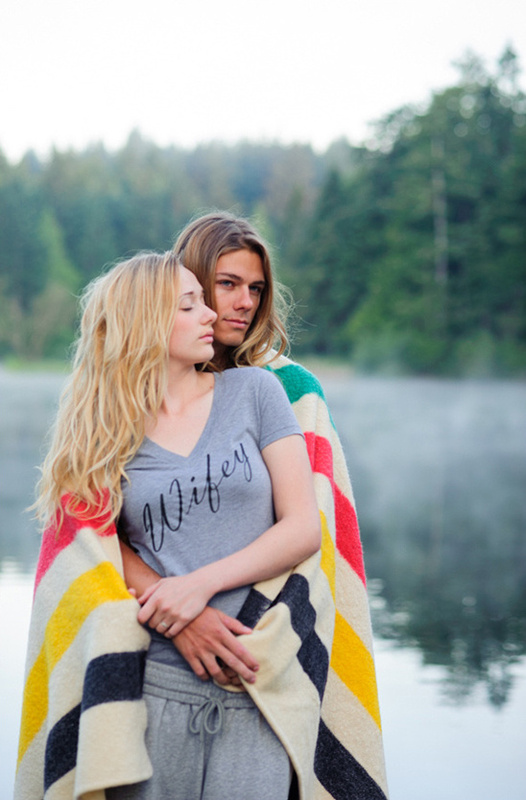 A glamping wedding is not for the faint of heart. It’s for those with an adventurous spirit, who love nature and are up for a challenge of the road less traveled. 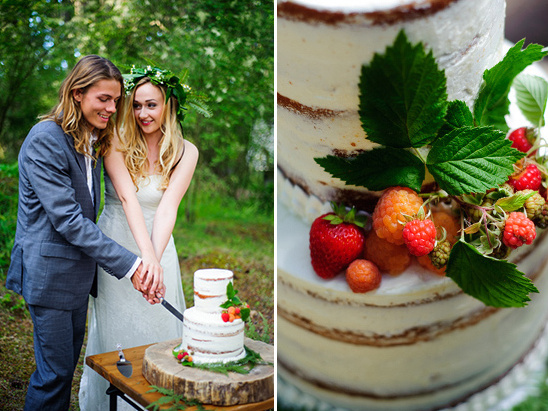 Whether you love camping, glamping, or just like to look at beautiful things, these love of nature wedding ideas are sure to leave you swooning. 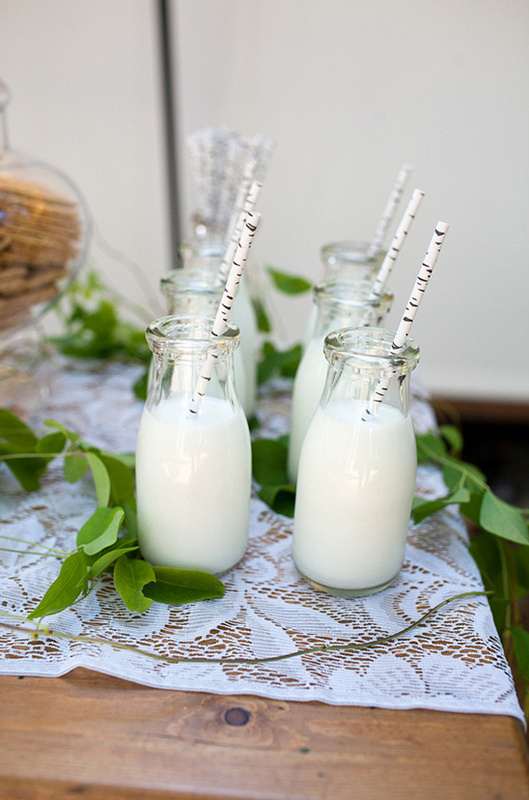 Keep reading for super handy tips on how to create a glamping wedding that's perfect for you and your guests. 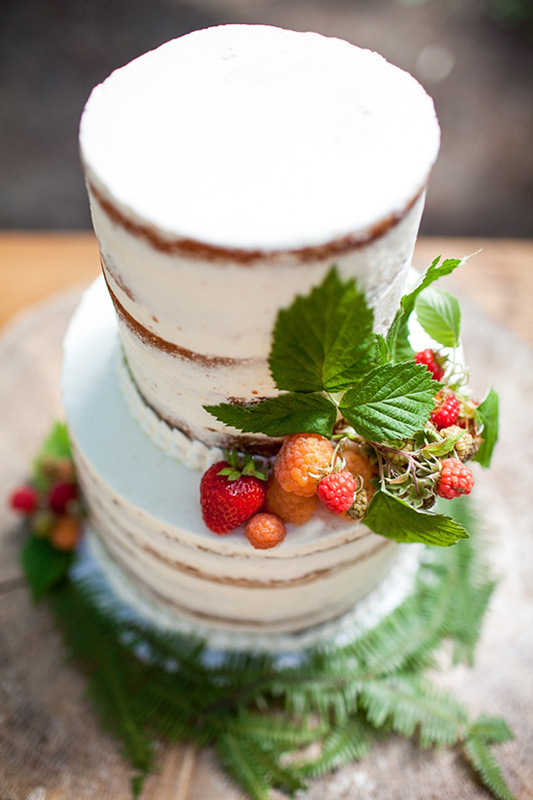 Don't forget there are even more fabulous details in the full gallery here, captured by Rebecca Anne Photography and Jenny Ostenson Photography. Location: You'll have a few things to think about and decide on when booking your venue. Do you want log cabins, canvas tents, airstreams, yurts, safari tents, tree houses...or maybe another option? Lakedale Resort offered many options for all types of weddings and event sizes including a grassy point encircled by lakes, a wildflower-filled meadow, on their lodge deck with the sun setting on Neva Lake, or barefoot on one of their private beaches. A few tips we suggest for choosing your location: 1. Be mindful of how easily accessible it will be for your vendors to set up and tear down, as well as for your guests to get there. 2. Maybe plan different types of accommodations for different types of people. Grandma may not be able to climb into a tree house but a log cabin would work just fine! 3. Have fun with it. No matter what you choose, you can't go wrong! Flowers: You can have so much fun with this one. 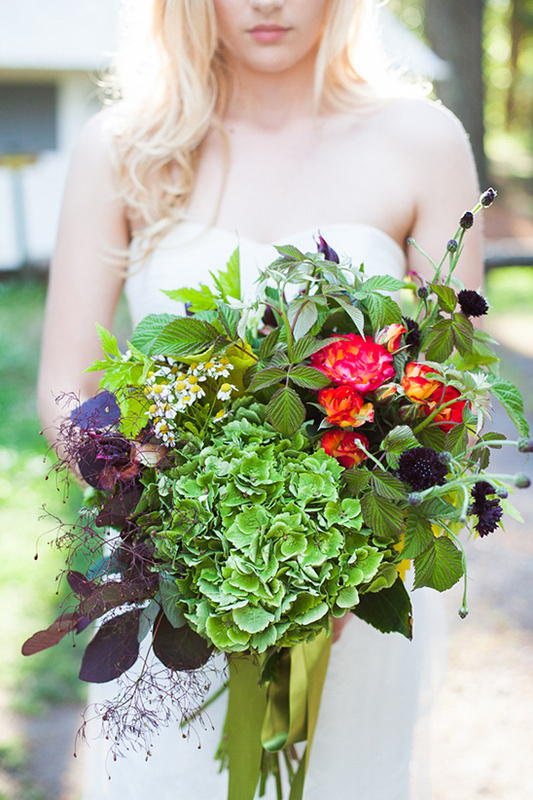 Maybe bring in bold pops of color to stand out against the evergreen trees surrounding you. 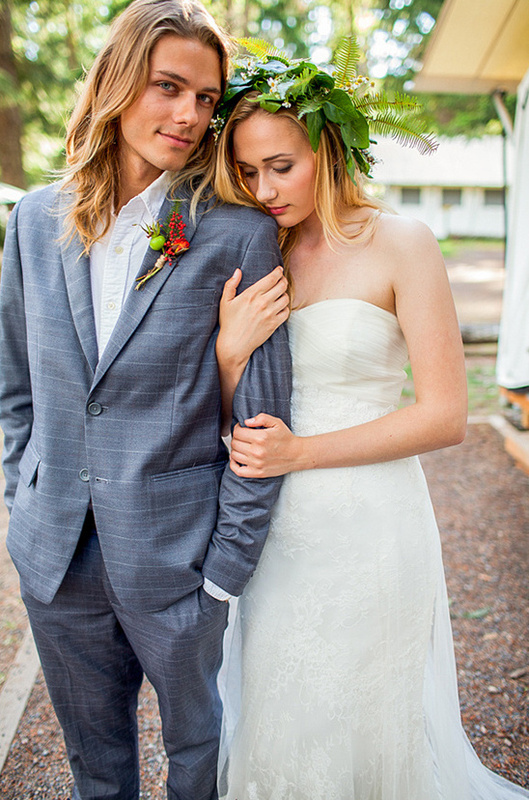 Or perchance add pine cones to the bouquet or boutonnieres to tie in the theme! Make sure, however, to have buckets of water for your flowers as a fridge or cool area may not be readily available to keep them fresh. Guests: You may want to plan to have a smaller number of guests as most glamping sites are not able to accommodate larger crowds. Also consider the types of accommodations that are provided and the types of people you are inviting and what may suit what types of people. 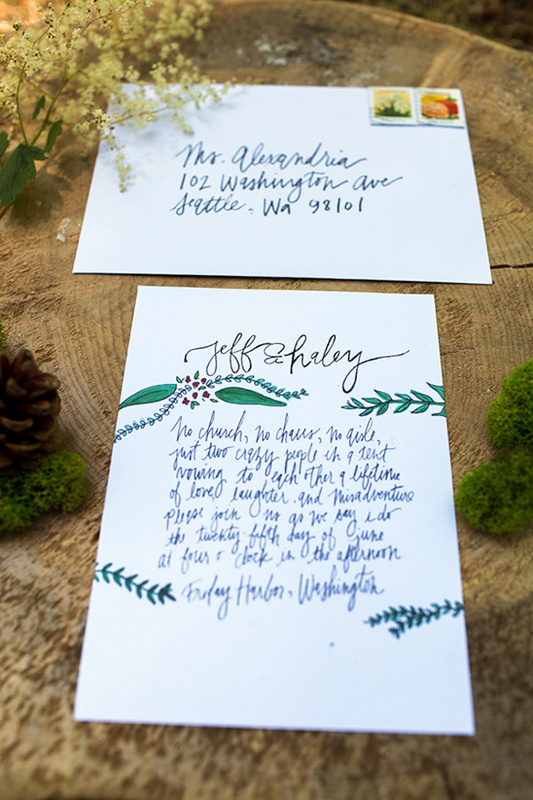 We would suggest including a checklist of items for your guests to bring with them in your invitations. 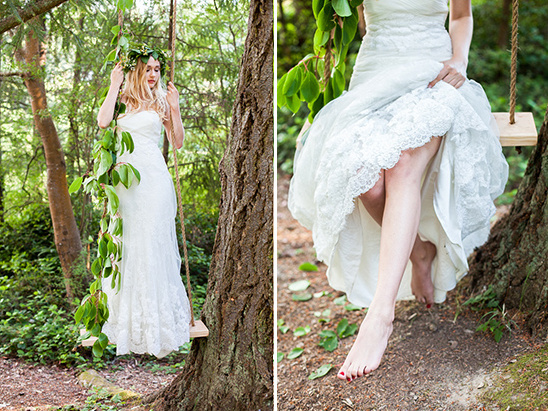 The Dress: If you are having a glamping wedding, we can probably already guess you aren't the most traditional couple. So don't have a traditional dress. Also think about how easy it will be to move around outside in that dress. 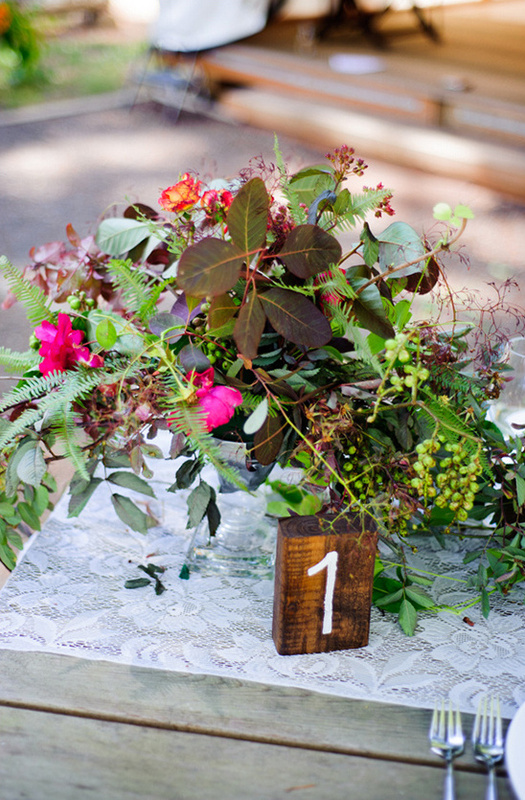 Will you gather pine cones in your train like our bride did? Bridal Party Attire: Make sure not to pick out stiletto shoes for your bridesmaids if they are going to have to hike to your ceremony location. Also think about how hot or cold it may be for them in their attire. Maybe guys don't need jackets and would be more comfortable in light colored suits? Or perhaps the girls will get cold in the evening so add a fun sweater into the mix. Food: Plan food that fits your theme. You don't necessarily want a 4-course meal at a location that does not provide a kitchen. 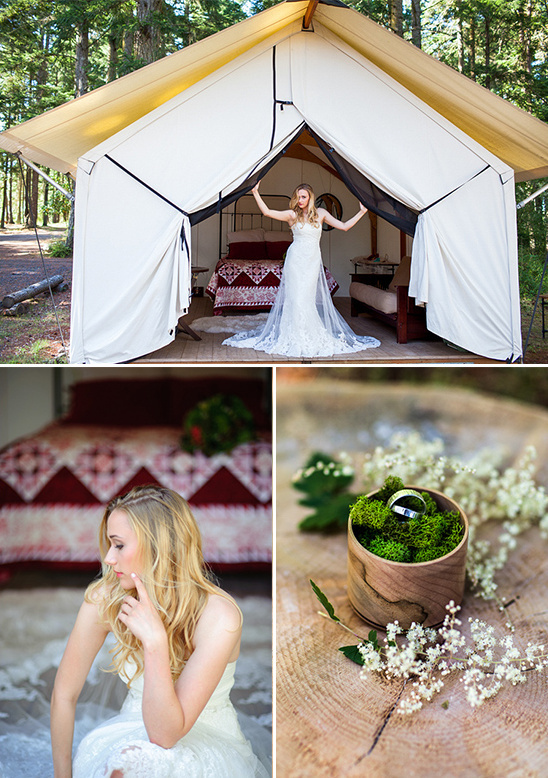 Activities: This may link back to your location choice but glamping offers a variety of activity options that no other type of wedding can provide. 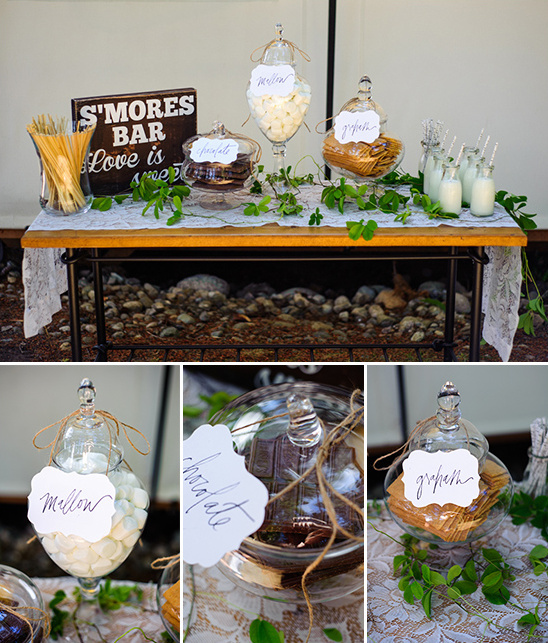 Plan for s'mores, boating, bocce ball, croquet, hiking, or sleeping under the stars! You could even plan separate games for the kids! 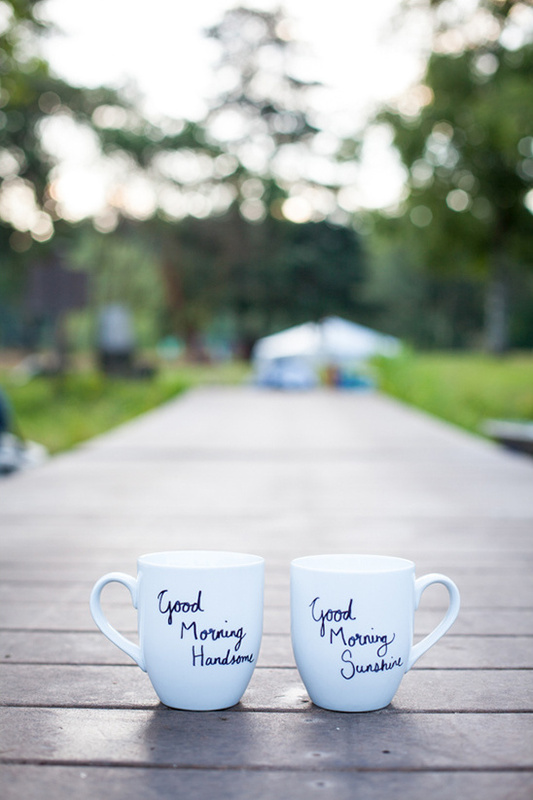 You can also have a super sweet morning after shoot with your new spouse, matching hubby and wifey tees, darling couple mugs and some hot cocoa!